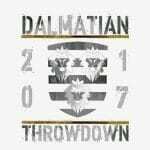 Dalmatian Throwdown 2017. is a 2-DAY INDOOR COMPETITION brought to you by CrossFit Split. Finals will take place on October 14/15 in the largest arena in Split – Spaladium arena! Registrations are open from May 22nd. Demonstrate strength, endurance and overall fitness and sign up! Two online qualifiers will run from June 26th to July 13th.